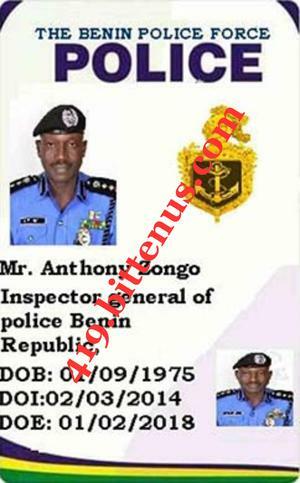 My name is Mr. Anthony Zongo the Inspector General of INTERPOL POLICE DEPARTMENT BENIN. This is to officially inform you that all the money you have lost to those scammers, it has been recovered. This was succeeded with the help of the (SFC) State Finance Commission. Instructions are given by the President Of this Country Mr. Patrice Talon, to move this funds over to the United States SUNTRUST BANK, NY. Am sending this notice for you to know the GOOD NEWS. Attached you will find a copy of my work ID CARD. A total sum of $200,000 U.S dollars were moved over to the SUNTRUST BANK for you, the money is recovered from the ZENITH BANK Benin Republic COTONOU CITY. They were arrested by the Police and confessed that it was part of the money they extort from you in the past years. Please take note, you have been warned to stop every other communications you have with any other person or offices claiming to be government officials or working in any bank offices here in BENIN. The Government Of Benin Republic have set out Anti-graft Agency to trace all those offices in COTONOU involved in this criminal act to be probed. Your funds are now in the SUNTRUST BANK, NY. A total sum of $200,000 USD this will be paid to you in a form of cashier check. The cheque is an International Certified check, it will be accepted in any bank Worldwide. The cashier check will be mailed to you the moment you receive the check, take the check to the bank and receive the money in cash. I want you to email the SUNTRUST BANK today and inform them you are the owner of the cashier check deposited with them the sum of $200,000 USD that you want a quick delivery to be done today. Please try and give him your full name and address where to deliver the check to you. As soon as you receive the funds from the SUNTRUST BANK, kindly get back to us to know about the successful payment you receive OKAY. INSPECTOR GENERAL INTERPOL POLICE DEPARTMENT BENIN.